In this buying guide, you’ll learn about the different types of cat carriers on the market, which qualities set the best carriers apart, and how to choose one that’s right for your cat. Because every trip has slightly different requirements, our list of top carriers includes the best choices for various activities and needs, including car travel, plane trips, and short trips to the veterinarian. Hard plastic carriers appeal to casual users who pop their cat into the carrier once a year or less. They’re convenient, easy to handle, and secure. Unlike some soft carriers that can’t hold up to clawing, it’s virtually impossible for a cat to break out of a hard carrier. Hard carriers are a good choice for those who want maximum ease-of-use. If your cat has a tendency to get carsick or has anxiety-induced accidents, you’ll appreciate that hard carriers are easy to clean. You can spray them out with a hose and let them dry in the sun. Because they are large and don’t compress underneath the seat, hard carriers aren’t the best choice for airline transport. They tend to shatter during pet carrier crash tests, so if you’re concerned about safety or going for longer, more frequent car trips, soft carriers are a better choice. We’ll talk about that more in the next section. Compared to hard carriers, soft cat carrier bags are a better choice for cats who are always on-the-go or traveling long distances. Plane travelers will appreciate that soft carriers can slide under the seat as carry-on luggage, and car travelers will like that soft cat carriers score better in Center for Pet Safety crash testing. If your cat is an unhappy traveler, beware that soft carriers are harder to clean out than hard ones. They’re also easier for cats to escape from. Ambitious cats can claw their way through mesh windows or even unzip the doors on their own. 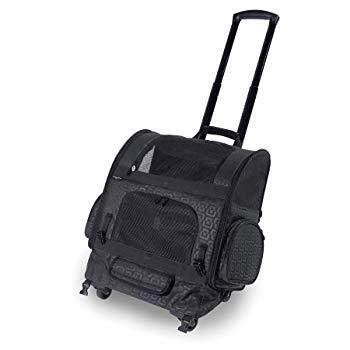 Cat carriers with wheels are perfect for people who like the ease of dragging a roller suitcase. These carriers are typically built with plenty of storage space for cat care essentials and have soft, comfortable interiors. The main drawback of a roller carrier is the fact that some cats are scared by the sound of wheels rolling over the ground, especially on uneven surfaces. Some roller carriers convert into backpacks, which allows you to easily transition between activities and different terrain. While usually not designed for airline or automotive use, backpack carriers are ideal for people who want to go for walks and hikes with their cat. 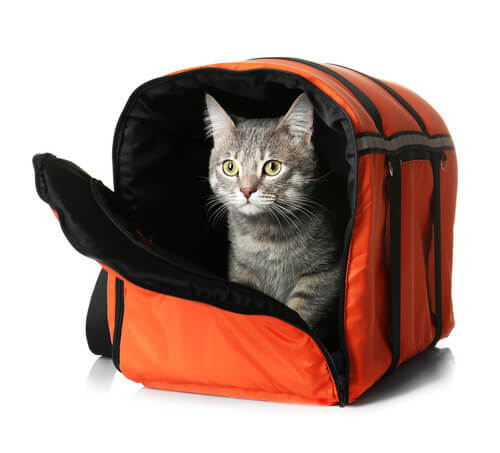 The pack is a refuge in the case of a wildlife or dog encounter and gives your cat a place to rest their legs. The best cat carriers are right for their job. Before you choose a cat carrier, ask yourself a few questions about the places it will go. Are you going on a trip by plane? Crossing the country in a car? Are you looking for disposable cardboard cat carriers for temporary rescue use, or do you just need a basic carrier that will get your cat to the veterinarian and back a few times a year? Defining your needs will help you to identify the best carrier for your situation. People often think of their cat’s carrier like a child’s car seat, assuming that because the carrier is designed and approved for use in an automotive vehicle, it will keep their cat from flying through the windshield if they get into a wreck. This assumption is wrong. First of all, most carriers aren’t tested by an independent organization. As revealed by the Center for Pet Safety’s 2015 crash testing of several pet carriers, most “car-ready” carriers will not protect your cat in the case of a crash. In fact, most plastic crates bust into shards on impact, launching broken pieces of plastic and metal parts across the car. These could injure all occupants of the vehicle. If you’re traveling with your cat in a car, choose a crash-tested and CPS-certified carrier if possible. There are only a few crash-tested models on the market, and they’re all expensive. If you can’t get one of these premium carriers, do your best to secure your cat’s carrier and position it safely in your vehicle. According to Lindsey A. Wolko, founder of the Center for Pet Safety, the safest place for your cat in the car is on the floor behind the front seat. Alternatively, you can use a seatbelt to strap the carrier in place on one of the back seats. While this will help you out if there’s an abrupt stop at low speeds, most carrier straps will snap if there’s a high-speed collision. You may be aware of the risks of traveling with your pet in the plane’s cargo hold. Fortunately, feline travelers are small enough to qualify as carry-on luggage and can slide under the seat in front of you. When traveling with your cat by plane, your challenge is to find a carrier that fits in this space. Soft carriers are best for airline travel because they’re flexible enough to crumple down slightly to accommodate the height of the seat ahead of you. Some cat carriers are marketed as “airline approved”, but this term isn’t necessarily a free pass to in-cabin transport. The term usually just means that the carrier can contain moisture. If your cat has to “go” during the flight, it won’t leak onto the floor of the plane. A better way to ensure that the carrier is the right size is to compare its dimensions to your airline’s under-seat space and maximum sizes for in-cabin carriers. Using US airlines as a guide, the average under-seat dimensions are 17” x 11” x 9”, but this will vary by airline and your seat on the plane. They’re easy to clean- Plastic carriers should have smooth interior surfaces that won’t collect grime over time and are easy to wipe out. Soft carriers should have machine-washable removable padding and the body should stand up to at least a wet rag and soap. They’re strong and durable- The best cat carriers have sturdy floors that won’t sag under your cat’s weight. In addition to sturdy bottoms, your cat’s carrier should be constructed from tough materials and won’t rip or unravel. Look for windows made from rubberized, rather than fabric, mesh. It’s stronger and can handle a little claw action. They’re easy to get your cat in and out of- It shouldn’t be difficult to slip your cat into the carrier and help them get out once you reach your destination. Note that many veterinarians prefer to handle their patients while still in the carrier. Multiple entryways, top entry designs, and zip-off walls make this process easier. They’re the right size for your cat- The carrier should be relatively snug and secure and shouldn’t let your cat slosh around during transport. At the same time, your cat should have 3-4 inches of space on all sides so that they can stand up and turn around without crouching and contortion. Here are our picks for the best cat carriers on the market. Our top choice is a soft cat carrier that’s airline approved and crash-tested for car safety. 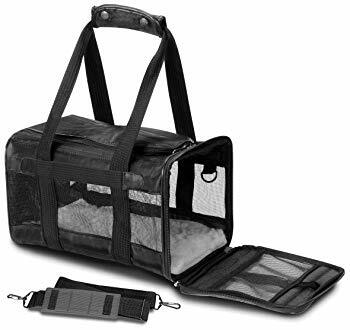 This soft cat carrier has an elegant design that allows it to effortlessly transition from airport to interstate. At just under $160, it’s a little expensive for occasional transport, but the features and quality design make this carrier worth the price for cats who travel. Airline size restrictions vary, so a cat carrier that meets requirements on one airline might be turned away on another flight. This cat travel carrier from Sleepypod aims to solve this problem. So that it can accommodate varied under-seat configurations, the carrier compresses from 22 inches long to 19-16 inches. When boarding, you’ll press in the ends until the carrier is the right size for your space. When it’s safe to do so, you may rotate the Sleepypod so that it’s perpendicular to the back of the seat, expand the ends, and let your cat stretch out. Some people unzip and open the end at this point, giving their cat even more space and the opportunity to see the cabin. The carrier’s internal safety tether attaches to your cat’s harness and helps to keep them secure within the carrier. 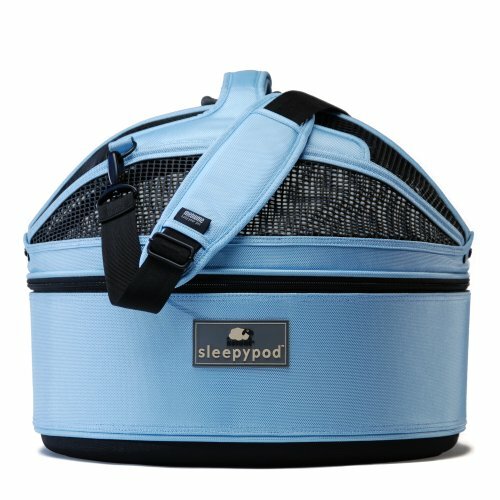 So that you can safely drive your cat to and from the airport, the Sleepypod is built with straps on both sides. This allows you to wrap a seatbelt all the way around the carrier. It’s been crash-tested and certified by the Center for Pet Safety or CPS. It has two large windows and a removable privacy panel. Its additional features include large zipper pockets on both sides and the option to pair it with an electrically-powered warming pad. The Sleepypod Air fits cats weighing up to 18 lbs. It’s available in six colors: jet black, dark chocolate, strawberry red, robin egg blue, orange dream, and glacier silver. 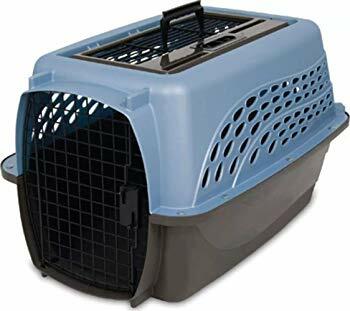 Like all hard plastic carriers, this carrier has its limitations, but it’s a well-designed kennel perfect for securely moving your cat from home to the vet’s office. 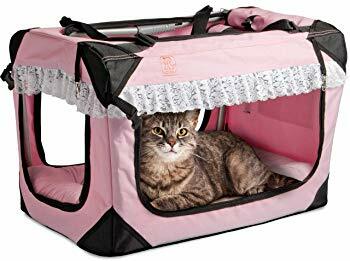 It has dual entry from both the front and the top, allowing your cat to enter through the front door or drop into the carrier through the roof. The top door entryway is also large enough for you to pass both hands through, allowing you to pet your cat during travel. The doors are easy to open using easy-squeeze latches. Unlike some carriers that are held together with plastic latches, this one screws together with wing nuts and bolts for increased durability and security. It’s available in four pearlescent shades: white, pink, blue, and tan. The carrier comes in two sizes for cats weighing up to 20 lbs. The carrier isn’t crash-tested or approved for use in the car, but the company recommends that you pass a seatbelt through the handle for added security. It’s also not a good choice for flying in-cabin, though it’s approved for use in a plane’s cargo hold. The Sherpa Deluxe Airline Approved pet carrier is covered by Sherpa’s Guaranteed on Board program. After buying the carrier, you’re prompted to go online and get both your cat and carrier pre-approved for boarding. If something goes wrong and your cat is denied permission to go on-flight, Sherpa will reimburse your flight and pet fee. A patented spring wire frame allows you to push the rear end of the carrier down if needed. This helps the carrier to conform to varied under-seat space restrictions. The carrier has both top and side entry for easy access, mesh panels on the front and sides for ventilation and visibility, and adjustable straps. For carrying over-the-shoulder or by hand. The carrier comes with a machine washable faux lambskin liner for comfort. The base is supported by a wooden stability board encased in a waterproof liner. Once you’ve reached your destination, you can thread a seatbelt through Sherpa’s seat belt strap for increased security. Note that the carrier hasn’t been approved for car safety by any independent organization and may not be the safest choice for car travel. The carrier is available in six colors: original black, charcoal, black lattice, original brown, original gray, and original plum. The Sleepypod mobile pet bed and carrier is one of the very few carriers that’s passed crash testing and meets the same standards set for child car safety restraints. In other words, it’s as close as you’ll get to a real car seat for your cat. In addition to providing a safe ride, the Sleepypod attempts to reduce travel stress by doubling as a cozy pet bed. The domed cover zips off and can remain off when you’re not traveling. This helps your cat create a positive connection with their carrier. When in use, you’ll zip on the mesh domed cover, zip the top closed, and use the padded handle for transport. The carrier has a water-repellant padding cover, machine washable bedding, and a sturdy ballistic nylon exterior. All of these qualities make it durable and relatively easy to clean. The Sleepypod has a stylish round shape and is available in 7 colors. These are arctic white, blossom pink, dark chocolate, jet black, sky blue, strawberry red, and violet. Top loading cat carriers are all about making it easy for your cat to enter the carrier and easy for you to reach them once they’re in it. This one has an unexpected pod shape with a mesh front door, ventilated body, and round lid that zips all the way open for easy entry. The large top zip door also gives you full access to the occupant once they’re all packed up. The top loading cat carrier has a sturdy bottom for effective transport and a small handle on top. It doesn’t have a shoulder strap, which is a disadvantage when compared to the typical soft carrier. The carrier unzips completely and can be folded into an easy-to-store flat disk shape. Many customers say that the carrier fit their large cats, including some weighing up to 18 lbs. At 24” x 16” x 16”, this large cat carrier like a little apartment for your cat. 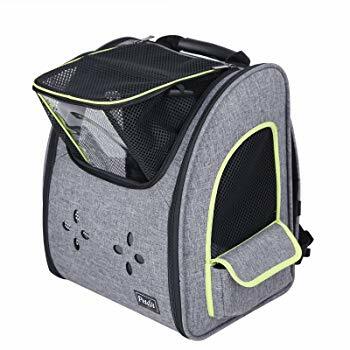 If you have multiple cats who like being together and comfort each other during travel, the carrier’s 45-lb weight capacity allows it to carry two or even three occupants. Its large size means it won’t fit under the seat of a plane, but it’s popular among people traveling long distances by car. One reviewer said that they bought it for a move of over 1,000 miles and was pleased to find that their cat started sleeping in it while still at home and continued to sleep in the bed for the first 400 miles of the journey. Others had similar experiences, saying that it was a comfortable alternative to a cramped traditional carrier. RV’ers and campers will appreciate that the carrier comes with stakes for outdoor use. Note that this isn’t a crash-tested carrier and it doesn’t have any dedicated restraint straps, so it’s not the safest choice for car travel. The carrier is made from heavy-duty nylon canvas and is outfitted with a machine-washable plush bed. While the body of the carrier appears to be durable, customer reviews indicate that the mesh isn’t particularly strong. Several cats used their noses and claws to press and scratch holes in the mesh. It’s available in four colors: navy blue, pink, tan, and pink with a lace valance. Note that this color scheme doesn’t have privacy shades. 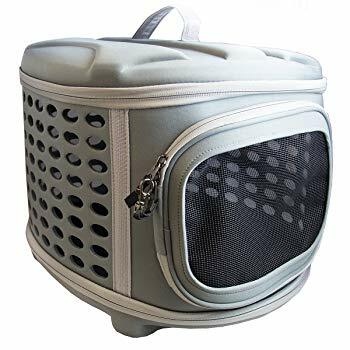 If you like the idea of rolling your cat around in their little crate, you can opt for the wheeled version of this carrier. While backpack cat carriers aren’t right for everyone, they’re indispensable for hikers and those who like to schlep their cats while walking. It has both top and side entry for easy accessibility and has a spacious interior for cats weighing up to 15 lbs. With a combination of front air vents and multiple mesh windows and doors, the backpack has good visibility and ventilation. The top door of the backpack is expandable with mesh and a clear plastic window, giving the passenger additional space and a large viewing area. The mesh windows are rubberized, so they should be able to withstand clawing. Thanks to a soft back, padded straps, and the inclusion of a hip and chest strap, this backpack is also comfortable for the wearer. If you’d prefer to carry the pack by hand, you can use the handle on top instead. This multifunctional carrier moves effortlessly from the car to the plane to the sidewalk. The airline-ready carrier is built with wheels and a pop-out handle. You can drag it across the airport like any other suitcase. Rumbling around in a roller carrier can be scary and uncomfortable, so this carrier has a smart-level platform to ensure that your cat doesn’t fall over when the carrier tilts. When you’re ready to go up stairs or walk down the sidewalk, you can convert the carrier into a backpack. The inner safety tethers attach to your cat’s harness to keep them secure during transport. Once you’re ready to explore, it’s easy to take your cat out of the carrier via the top and side openings. It features side storage pockets so that you can stash away treats, water, and anything else your cat may need during the journey. 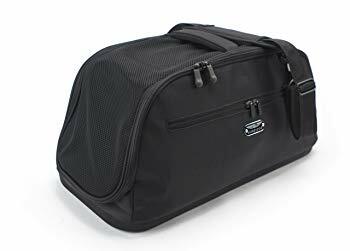 At under $13, this is an affordable tote ideal for people who don’t need a premium carrier—just a safe little transportation device for a trip to the vet or maybe for a move across town. The lightweight carrier supports cats weighing up to 15 lbs. 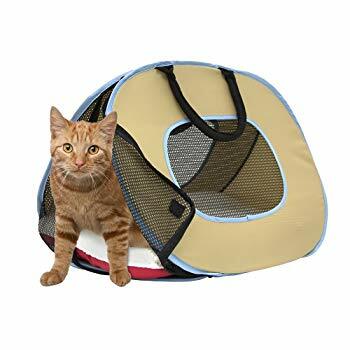 It’s shaped like a cat-sized tent with a handle and is available with or without a built-in bed. It comes in two designs—one is printed with a “live animal crate” design, while the other is tan and blue. It has several mesh panels for maximum visibility and breathability. You can take out the wires (which work like tent poles) and fold it down into a small disk that will fit in your drawer when not in use. Instead of cajoling or manhandling your cat into the carrier when it’s time to go to the vet or on a trip, why not help them to enjoy it? Here are a few ways to make carrier time more fun. Introduce it as a bed. Leave the carrier in a well-loved part of your house, place familiar blankets or a pillow inside of it, and let your cat use it as a bed or hideout. By the day of the trip, your cat should be familiar with the carrier and think of it as a comforting extension of their home. While some carriers are collapsible and easy to slide onto the top shelf of a closet when not in use, I don’t recommend this practice for several reasons. If a carrier remains folded and shelved most days of the year, your cat will never get to know it outside of stressful situations. If they never see it until five minutes before they’re toted into the car, your cat will inevitably associate the carrier with that stressful event. Secondly, having a cat carrier at the ready is an important part of emergency preparedness. If you need to evacuate your home suddenly, you should be able to pop your cat in their carrier and go. Give it a familiar scent. As touched upon in the last tip, familiar scents will help your cat to soften towards their new carrier. By placing well-loved blankets, towels, a cat bed, or your own clothes inside of the carrier, you tell your cat “this is yours”. 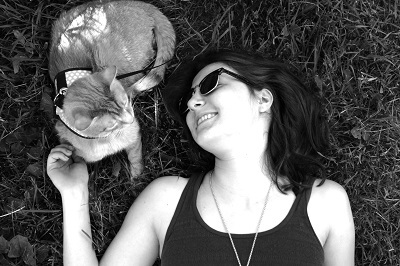 If all goes well, your cat will eventually mark the carrier with their own facial pheromones. In the meantime, you can use a synthetic pheromone spray to soothe your cat and identify the carrier as a safe place.